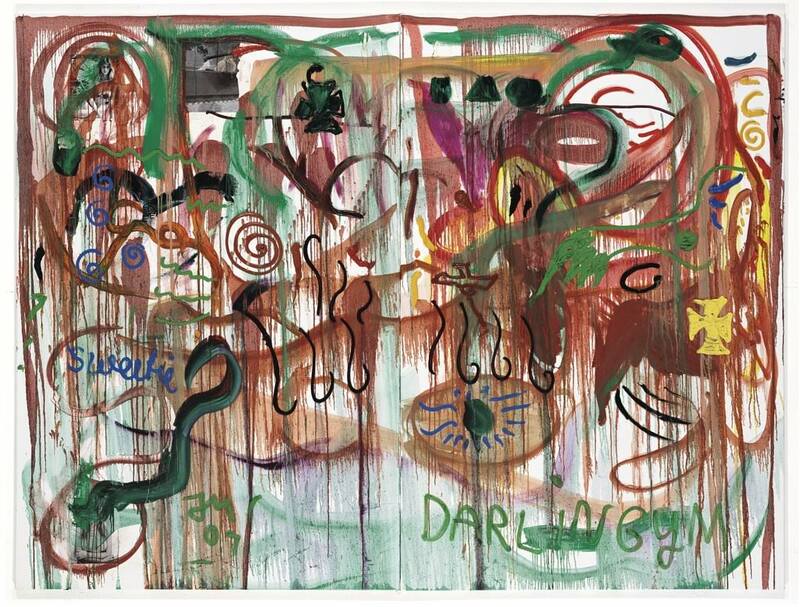 Jonathan Meese (German, b. 1970) is an installation artist, painter, performance artist, and sculptor. Meese was born on January 23, 1970, in Tokyo, Japan. He attended Hochschule für bildende Künste Hamburg, but he left when the Contemporary Fine Arts gallery in Berlin took notice of his work. In 1998, Meese presented one of his early installation works at the first Berlin Biennale. Since that time, Meese has been included in numerous exhibitions throughout Germany. 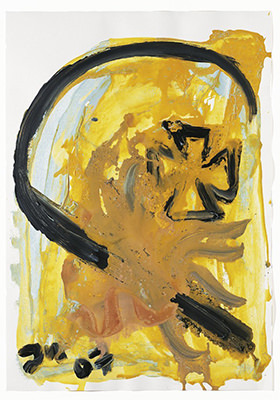 He has also exhibited his works at Stuart Shave Modern Art in London. His works have appeared at exhibitions in Paris. Meese’s first major solo exhibition in the United States took place at the Museum of Contemporary Art in North Miami, FL. Included in the exhibition were works blending collage and hieroglyphics. In addition, Meese included a variety of sculptures in the show. The exhibition remained on view from December 2010 to February 2011. Meese collaborated with composer Karlheinz Essl on an installation shown at the Essl Museum in Vienna. Meese has also collaborated with a number of other painters, including Tim Berresheim (German, b.1975) and Daniel Richter (German, b.1962). Meese’s works frequently cross numerous media lines and include drawings, collages, and writing. In addition, Meese designs theater sets. As a performance artist, Meese has written and starred in theater productions, including De Frau: Dr. Poundaddylein – Dr. Ezodysseusszeusuzur. He created a stage design for the opera Dionysus for the Salzburg Festival in 2010. Meese’s personal interests, including horror films, comic books, Outsider Art, and medieval crusades, are often reflected in his works. German Expressionism reflecting social discontent and the horrific realities of war regularly forms the basis for Meese’s artwork. While self-portraits are a common component in many of Meese’s works, his image is frequently transformed through a variety of characters, including divas and demons. These characters are commonly used to explore the reality of power. As a collective, Meese’s works make gripping narratives. Meese is based in both Berlin and Hamburg.